Israeli Prime Minister Benjamin Netanyahu is not known for missing an opportunity to push peace further into the distant future. The dust had not even settled on the Balfour Centenary, which the Palestinians marked with anger and Israel and its supporters celebrated, before Netanyahu took to the air to absolve Israel of any fault for the lack of progress towards peace. Israel is in a difficult neighbourhood and therefore its security needs are such that meeting these is almost incompatible with a Palestinian state. Netanyahu took issue with Marr regarding the settlements, saying “the idea that Jews cannot live in Judea [the West Bank] is crazy”. When challenged that it is Palestinian territory, which the UN says is a flagrant violation of international law, he said that it is “disputed territory”. He even claimed that the settlements are “a side issue for Palestinians too,” arguing that he is continuing to work for the liberation of the whole of historic Palestine. He argued that it was about the kind of state that emerges. To him it would have to be demilitarised and recognise the state of Israel. In fact, the Palestinian Authority has already met both these conditions. In signing the Oslo Accords, the PLO recognised the state of Israel while Israel did not recognise a Palestinian state, but rather the PLO as the “sole representative of the Palestinian people”. In the wider context, the real threat to Israel is the Iranian threat. 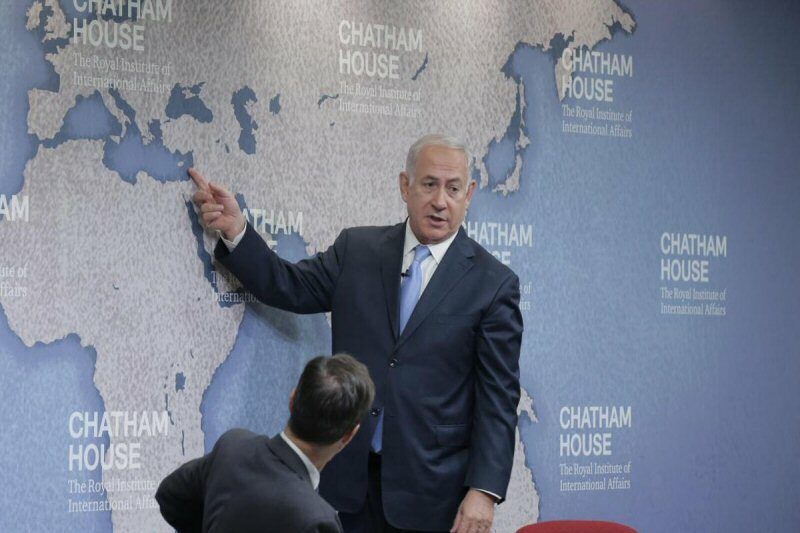 In a Chatham House interviewearlier in the same week, Netanyahu argued that Iran was a “cause”; an expansionist country that wanted to gobble up small and medium-sized states as it moved towards the “larger states”. To him, Israel shares this fear with Sunni-majority countries. He presented Israel as the only example in the Middle East of what he called “modernity” vs. the “Medievalists,” which were both Shia and Sunni Islamists. He pointed to the British not wanting “outside control” on their economy, hence Brexit, and pointed to the lack of “economic sovereignty” that Greece has, referring to his “friend” Prime Minister Alexis Tsipras. He argued that in the complex world we live in, there are constraints on what are considered sovereign powers. His argument was that in the case of historic Palestine, the land was too small to divide. He said that he had presented to US President Donald Trump a map which showed the distance from the West Bank to the Mediterranean as 50 kilometres which he said was the same distance form “Trump Tower to the George Washington Bridge”. If Israel leaves the West Bank, then “militant Islam” would move in as happened in Gaza and Lebanon. It is either a “green flag” or a “black flag.” While not wanting to “govern the Arabs,” he wants overall security from the river Jordan to the Mediterranean: “For us the critical thing is to have the overriding security responsibility.” The demilitarisation of the West Bank would be done by Israel. In other words, no Palestinian state will emerge but an entity which would have governing sovereignty but no security sovereignty. At the same Chatham House event, Netanyahu described the demand for the removal of West Bank settlers as “ethnic cleansing,” comparing the settlers to Palestinian citizens of Israel. “From the Palestinian point of view, why do I have to take out Jews for peace? Do I have to take Arab citizens out of Israel for peace?” The comparison between Palestinian citizens of Israel and the illegal settlers is absurd. The Palestinians were there before Israel was created while the settlers were moved into the West Bank, East Jerusalem, Gaza and the Golan Heights in breach of international law. Their removal would correct a wrong. This is not the first time Netanyahu has used this analogy. In 2016 he was rebuked for using it by the UN Secretary General Ban Ki-Moon and the Obama administration. The Obama administration described it as inappropriate: “We believe that using that type of terminology is inappropriate and unhelpful,” State Department spokeswoman Elizabeth Trudeau said. Perhaps Netanyahu feels that with Donald Trump in the White House, this approach will find favour. Another term that needs adjusting according to Israel is refugee. The claim now is that Jews that migrated to Israel from Arab countries at its inception are refugees in the same way as Palestinian refugees deliberately driven out of Palestine in 1948 are regarded as refugees, despite the fact that they are not formally recognised as refugees by the UN. In Netanyahu’s eyes, rather than Israel work towards meeting its obligations under international law for peace, he is attempting to create confusion and change the discourse to make ending the occupation and creating a sovereign Palestinian state a threat to Israel’s very survival. The two terms he is out to remould are now sovereignty and ethnic cleansing. I wish he was using the brain power around him to pursue genuine peace with the Palestinians instead of thinking that the status quo and redefining a couple of terms will bring Israel peace or security. Professor Kamel Hawwash is a British Palestinian engineering academic based at the University of Birmingham. He is a commentator on Middle East affairs, Vice Chair of the British Palestinian Policy Council (BPPC) and a member of the Executive Committee of the Palestine Solidarity Campaign (PSC).